One hundred years ago, the International Institute of Buffalo was a program serving foreign-born women. Today, the Institute is an established WNY organization, serving thousands each year and employing 40 individuals, with an operating budget of more than $3.5 million. The Institute offers integration, refugee resettlement and employment programs; provides services to survivors of domestic violence and human trafficking; offers translation and interpretation services to break down barriers; presents global education programs for students, adults and businesses; and hosts international visitors. On an average day, dozens are welcomed into our building. Some are newly arrived to America and beginning to learn English. Some come to acquire job skills, become interpreters or receive interpreting and translation assistance. Others come to learn how to support WNY’s growing diversity, or to seek refuge from domestic violence and human trafficking. Buffalo is a rich tapestry because of the diversity of its people. Almost all of our ancestors came here to build new lives. Hope, expectation and anticipation of a new and better life were with each new group that came to the United States. Fear and isolation were with them as well. All these feelings persist for new arrivals today; the challenge of a new language and culture remains as well. Every day at the International Institute, we do all we can to welcome our new American neighbors and help make Western New York the place they can achieve their dreams. In 2016, the Institute adopted a new strategic plan. This document sets priorities, focuses resources and strengthens operations to ensure that we will realize our vision and deliver impact. This plan guides and shapes our decisions and actions as we enter our second century of service to our clients and Western New York. At the beginning of the 20th century, after World War I, 15 million people immigrated to the United States. Recognizing the need for specialized services for immigrants, the Young Women’s Christian Association (YWCA) established programs in affiliates across the country called International Institutes. The first Institutes were designed to provide social and humanitarian services to immigrants, teach English, and create opportunities for cultural expression. The International Institute of Buffalo was established by the local YWCA in 1918 to work with female immigrants, helping them to integrate and working to prevent their exploitation in domestic settings. In 1934, the International Institute of Buffalo incorporated as an independent nonprofit organization serving women, men and children. As the needs of newcomers changed, the International Institute developed into a Buffalo mainstay, helping ethnic communities rapidly integrate while honoring and preserving their heritage. We were the safe place for communities to come together. The statues of Dante Alighieri and Frederic Chopin in our music room – gifts from the new Italian and Polish communities formed here – attest to our role. In 2006, the Institute incorporated the former Buffalo/Niagara WorldConnect, an organization that hosted international visitors and provided global education programs to a variety of audiences. WorldConnect was a member of the World Affairs Councils of America and the National Council for International Visitors). The International Institute of Buffalo maintains these memberships and directs programming aligned with their goals. The International Institute is located in an elegant three-story Georgian revival mansion on Delaware Avenue in Buffalo, designed in 1888 by Esenwein & Johnson. Its first occupant was Harlow C. Curtiss, a practicing lawyer in Buffalo for nearly 40 years, who began his law career in the firm of Cleveland and Bissell whose senior partner was former President Grover Cleveland. 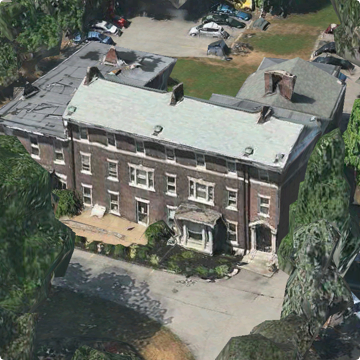 From 1905-1909 the house was owned by W. E. Silverthorne, who was building a new mansion across the street. The owner from 1910-1916 was Walter H. Schoellkopf, grandson of Jacob Schoellkopf, one of the founders of the Niagara Falls Power Company. Residing there from 1917-1919 was Daniel B. Good, who established the Seibert-Good Company in Chicago, which later consolidated with the Seymour H. Knox stores of Buffalo, and finally became part of the F.W. Woolworth Company. The last private resident, Frank Henry, was chairman of the board of the Washburn-Crosby Company, manufacturers of Gold Medal flour. The house sat vacant until the Temple of Unity and Truth occupied the site in 1941-1942. The Buffalo Association for the Blind (now Olmsted Center for Sight) called it headquarters from 1947-1973. In 1973, the mansion became home to the International Institute of Buffalo. Over the years, the Institute has also been home to a marvelous array of weddings, parties and many other activities. 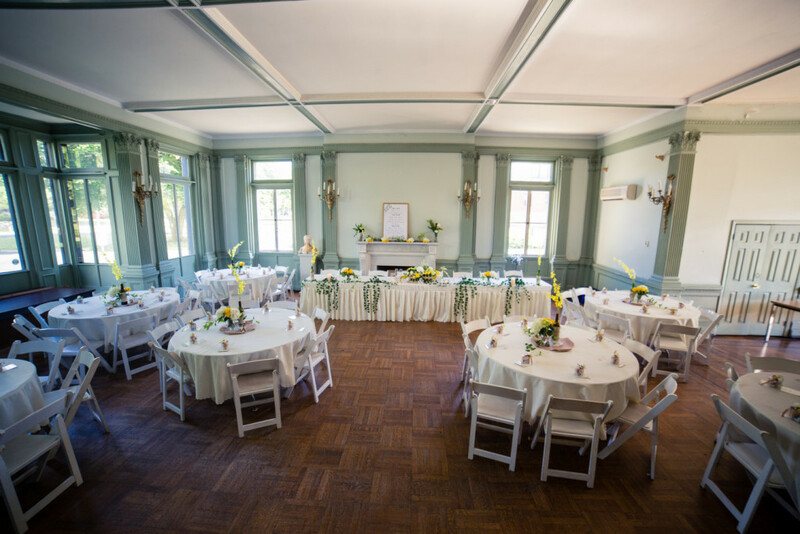 864 Delaware Avenue is a wonderful venue for parties, receptions, presentations, seminars and other events. The mansion has 5 large and adjoining rooms on the first floor, with 2 restrooms off the lobby. Capacity is 115 people for receptions of all kinds. Tours of the building are available by appointment only. For additional information on rental prices and preferred caterers, contact: Klara Chomicka at kchomicka@iibuff.org.